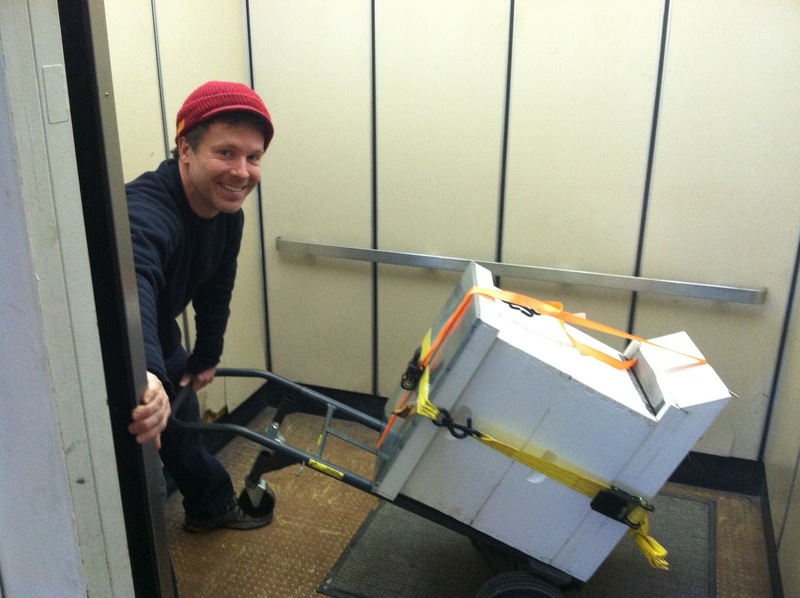 Moving beehives is one of those things best avoided, but sometimes it just has to be done. Choosing an apiary site is an imperfect science at best and 'perfect' locations are about as common as henteeth. Pretty much every site is a compromise in some respect and this is particularly true in the city. Beekeepers in the city don't have a lot of space, so we often have to take what we can get. People change as well; beekeeping is not for everyone and sometimes the only way to find out is to try it. If you decide it isn't for you, you're going to have move your hives one way or another. 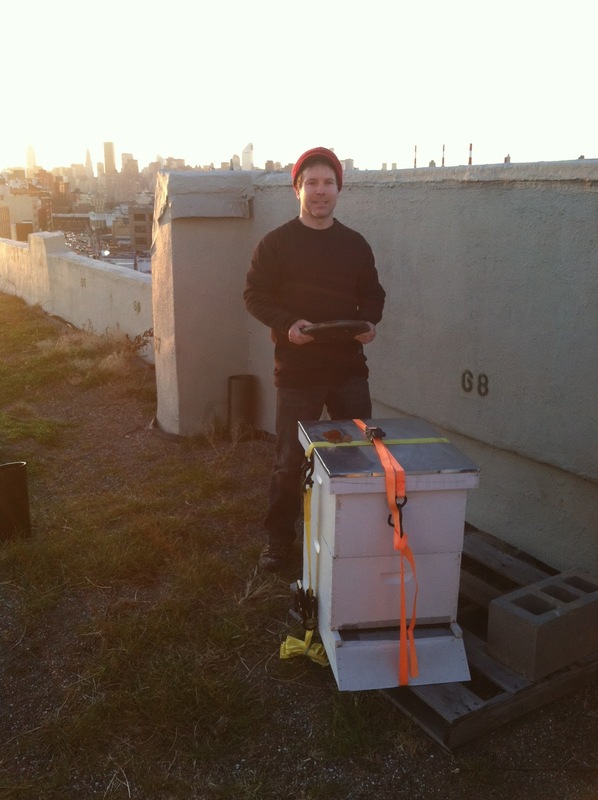 Moving a donated hive to the Brooklyn Grange last week. Accepting these apiary compromises means that we, as urban beekeepers, also have to accept that we might someday have to move our bees, either because we want to or because we must. With this in mind I generally recommend that people do not put bees on property they rent. Situations change, often when it is least convenient. Personally, I prefer to (and do) keep my bees in permanent, established community gardens and on top of buildings owned by people I know and trust. Still, if it was a choice between no bees and keeping them somewhere potentially inconvenient, I know what I would do. So say that you have a hive and you need to move it. How do you do it? It depends on a few factors. What's the weather like? How far are you moving them? Conventional wisdom says that you can move a hive two feet or two miles. Anything more than two feet or less than two miles and the foragers get confused and try to return to the original location they oriented to. Obviously this is a problem as there isn't a hive in that location any more. You end up losing most of your foragers, or about a third of your hive population. So what do you do if you need to move your hives more than two feet (which is probable) and less than two miles (which is likely)? Beehacks. (Beehacks?) More on that later. This guide will assume that you have easy access to both hive sites, either because they are ground level, or easily accessible via stairs or elevator. I'll be writing a follow-up for locations featuring roof hatches or otherwise limited access. The first thing you'll need to do is prep the new apiary site and gather the equipment you'll need. You should never move bees unless their new location is completely set up and ready to go, so that you can just set them down, open them up and let them be for a while. Moving can be traumatic, so it's best to give them time to adjust without prodding them any more than is strictly necessary. In terms of required equipment, the list is short: A vehicle large enough to carry the hives you'll be moving, one or two strong ratchet straps, window screening material, some branches or bundles of grass (*hint, hint*) and a staple gun or strong duct tape (I use Gorilla brand.) You'll want some extra hands as well. Optionally, bring your bee suit, your smoker, sugar to feed with, a hand truck, or a hive lifter. Once you've gathered your equipment, and gotten your new site prepared, you'll have to schedule a time to move the hives. In the winter, when it is too cold for the bees to fly, any time is acceptable. If it warm enough that the bees are flying (over 50F), you'll want to wait until the foragers are all back home for the evening so that you don't lose your field force. If you crack open the hive first, they will come to see what has happened. Can you spot the extended stingers? Seal them up first, curiosity be damned. 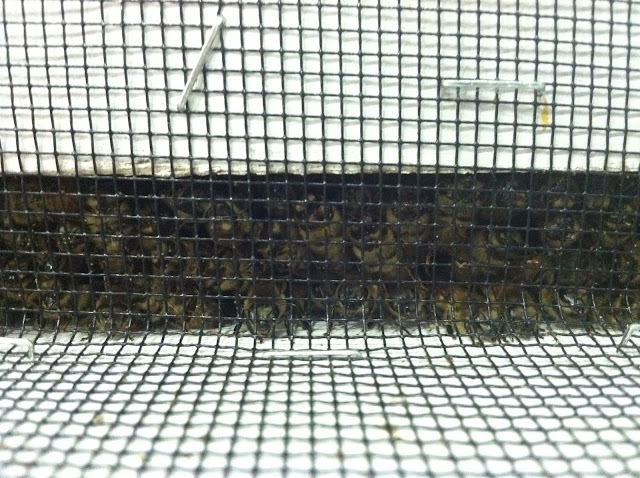 Once the bees are all in the hive, cut a section of window screening large enough to seal the entire entrance of the hive. If your inner cover has a notch as an upper entrance like the one from Brushy Mountain, you'll want to plug it up so that the bees can't escape. If it's warm out, you'll need to smoke the bees so they don't come flying out at you when you open the inner cover. I only squashed one bee. I consider it a victory. Once you start stapling, they'll come to investigate, so make sure that you have the mesh placed snugly and are holding it in place. Extra hands help. Take the screen and staple or tape it over the entrance so that it is completely sealed around the edges. The screening will keep the bees in, but allow some air circulation. If you have a screened bottom board, take out the sticky board so that they'll have plenty of air. With the hive sealed, you can secure it. Run the ratchet straps around the entire hive and cinch them down snugly, but not so tight that you tear into the wood. I like to use two ratchet straps, one front to back and the other left to right, so that they cross at the top and bottom. It's probably overkill, but better safe than sorry. Make sure that you seal up the hive before you ratchet them down. They don't like the vibrations and will come out to investigate. 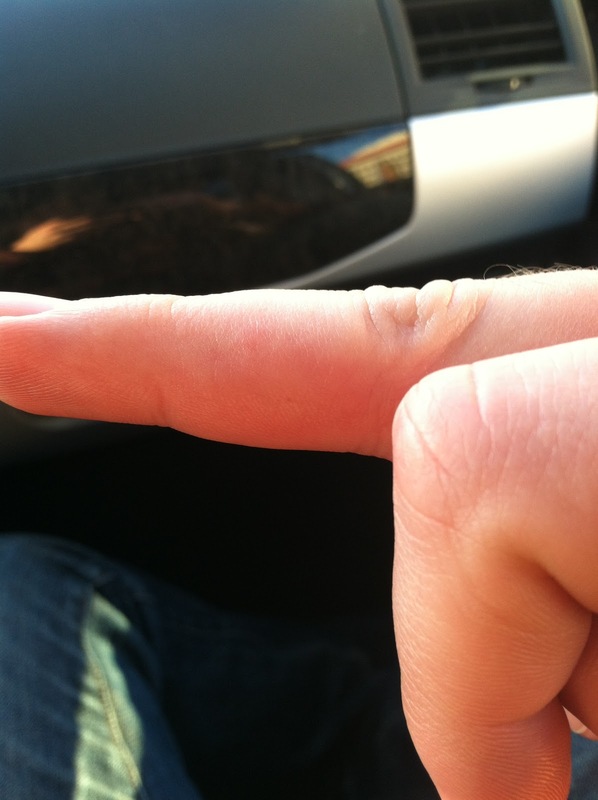 First sting of the year! Now that the hive is sealed and secured, it is ready to move. If you are carrying it by hand, pick it up from the front and back and be careful to keep it as vertical as possible so that the frames don't come loose. If you have a hand truck, make sure that you set it so that the back of the hive is against the metal frame. If you put the hive in sideways, the frames will tilt, break apart, squash bees, and possibly do some serious damage. If you have a hive carrier, follow the instructions, but remember to keep the hive level. Notice how the hive is only being leaned back, in line with the frames so that they don't shift. 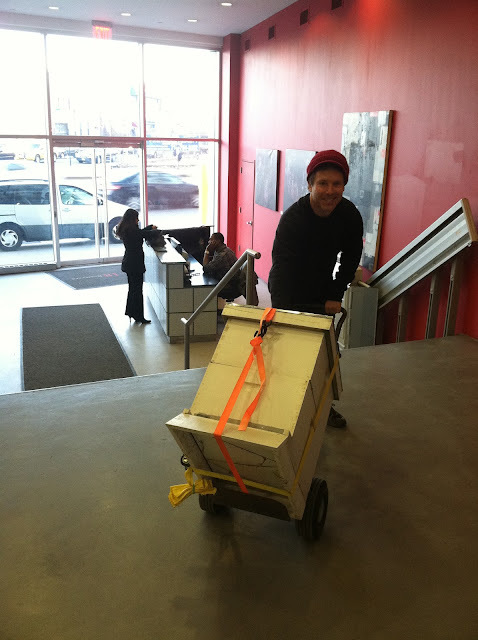 Load the hive into your transportation and take it to the new location. Unload it just as you loaded it, slowly and keeping it level. Set the hive where you want it and remove the ratchet straps. Home sweet home at the Brooklyn Grange. If you've moved the hive more than a couple of miles, you can open the hive and only lose a small percentage of foragers. The vast majority of the bees will take a short flight, realize that nothing around them looks remotely familiar, and reorient to the new location. You don't have to worry about any new foragers, since they'll orient to the new location as soon as they're ready to start flying. But what if you've moved the hive close enough to the original location that the foraging areas overlap? The foragers will take their first flight, spot a landmark they previously identified in relation to their old hivesite and use it as a guide to fly directly back home. When they get there, they'll find nothing and mill around, confused and possibly cranky, until it starts to get dark. At that point, they'll start looking for the closest hive to take shelter in. Chances are, it won't be yours and you'll end up losing up to a third of your population. If you don't want that to happen, there are a couple tricks (BEEHACKS!) that you can use to trigger reorientation behavior in older foragers. The simplest is to just keep the hive sealed in for a couple days so that the bees can't fly. Make sure that the hive has plenty of ventilation and food. Combined with the vibrations and shaking from the actual move, and many of the bees will pay extra attention to where they are and trigger reorientation. According to Michael Bush, author of The Practical Beekeeper, about 72 hours of confinement is the sweet spot. Any shorter and fewer bees will reorient; any longer and the number will plateau. You can also obstruct the entrance of the hive. When bees leave the hive, they leave on autopilot. They fly out with not a care in the world and only use landmarks for orientation on their RETURN trip. 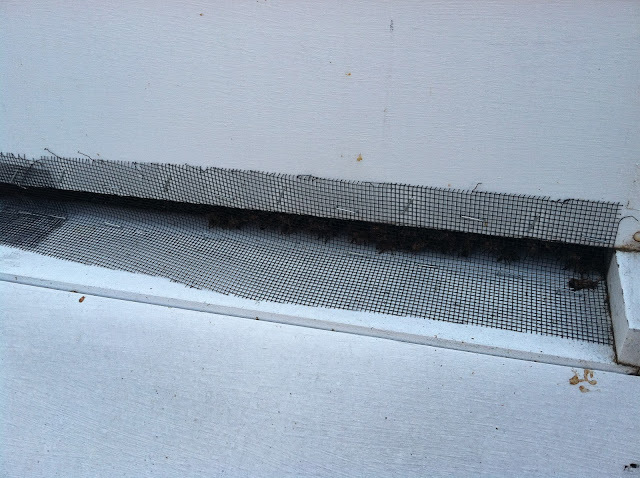 By obstructing the entrance with something the bees have to fly or crawl around in order to exit the hive, you force them to pay attention and register that something has changed. This change in the hive entrance will trigger reorientation to the new location. Loosely stuffing the entrance with grass so that the bees have to carry it aside works well. So does leaning some twiggy branches in front of the hive and over the entrance. You want to use something dense enough that all the bees will have to fly close through, but not something so thick that the entrance is blocked. After a couple a days, you can remove the branches, or let the bees remove the grass. After you've moved them, you'll want to give them a couple days (at least a week) to recuperate and adjust. In your first post-move inspection, pay extra attention to any damage caused by the move, and make sure that the queen is laying (if it is seasonable for her to do so.) 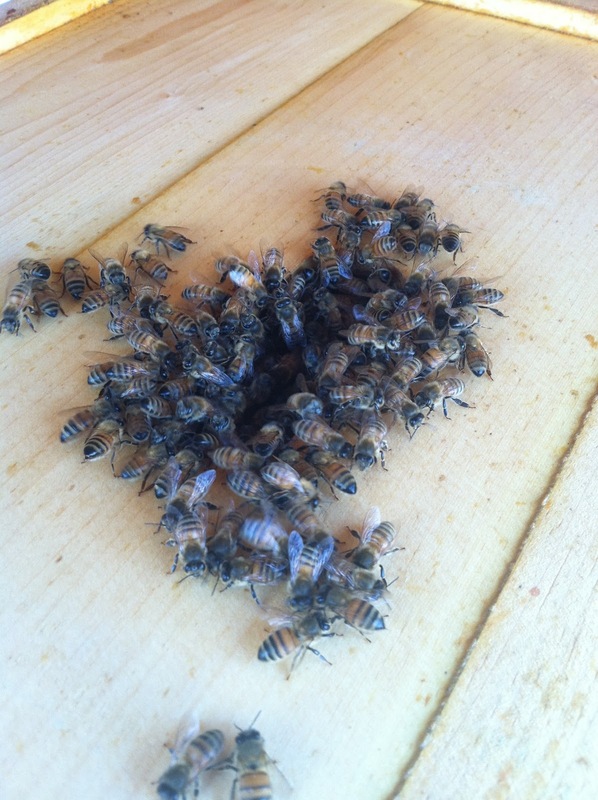 Queens tend to be a bit fragile, and the stress of moving can sometimes cause bees to ball, or kill, her. I'll be writing a follow-up article outlining how to move hives that cannot be moved in one piece because they are too heavy or because they are too large to fit through the entrance to the apiary (roof hatches), so check back later this week! 1.) Prep new site and equipment. 2.) Seal up hive entrances with mesh and secure with hive bodies with ratchet straps. 3.) Move hive vertically to new location. 4a.) If moved over two miles, let them loose. 4b.) If less than two miles, keep sealed for 2-3 days, and obstruct but do not block entrance to trigger reorientation. This is a great write up! I'm taking my first beekeeping class in 2 weeks. Excited! Oh, where are you taking it? I should add it to the calendar if I haven't already! that is before I saw that you were offering a class at the Brooklyn Brainery. I would have signed up for your class! I'm not sure whether I'll invest in a beehive setup this year, but I definitely am excited to learn about it. Maybe I'll look for an apprenticeship to get my feet wet to see if it's for me. Thanks for the tips. We've just acquired (this very evening) our very first hive from a retiring apiarist. I will go outside right now and dump some grass at the entrance. Cheers!